Over eighty years ago, our founder, Jack Cohen, pioneered a new philosophy in the retail eyewear business. His vision was that everyone who needed prescription eyeglasses wanted to look better, see better, and feel better about themselves. With this in mind, fashion eyewear (today known as designer eyewear) was introduced into the market. Providing the best quality products, the finest customer service and the greatest product value were also vital aspects of this new concept. 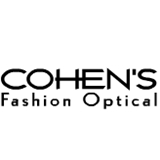 Today, there are over one hundred Cohen’s Fashion Optical stores in major malls and convenient city locations located in seven eastern seaboard states and Puerto Rico. True to our founding philosophy, we continue to offer you and your family the latest designer eyewear, lifestyle and hi-tech lenses, contact lenses, fashion accessories and eye exams. It was fast, informative and I got what I needed. Dr. Cooper was kind and professional.